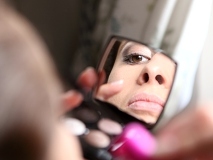 Renata Kostelnikova is a passionate, creative, and energetic entrepreneur. She was born in Moravia, Czech Republic and moved to Tuscany, Italy in 2000. Since then, Renata has established her own company in customized wine tasting and guided tours throughout Italy. She has provided travel journeys and experiences with services ranging from holidays by the sea, visits to historic cities such as Florence, accommodations in Renaissance villas, and wine tastings amongst vineyards in the hill towns of the Chianti and Brunello regions. Renata‘s latest specialization is in wedding planning. She is excited to share her love for this land and her expertise in wine and travel to customize your Tuscan dream wedding. 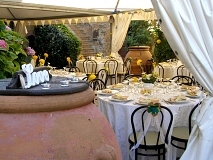 Tuscany, the ultimate romantic destination for you enchanting dream wedding. Ancient towns nestled atop gentle hills in the midst of a boundless sea of vineyards, olive groves and cypress trees where time seems endless. There is no other place in the world that embodies the harmony between Man and Nature, City and Country, Past and Present, and Beauty and Love like Tuscany does. 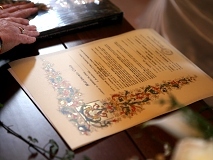 Tuscany IN Wedding will offer you our dedicated attention and expertise through years of experience in helping couples exchange their vows of love in Tuscany. Celebrate life´s most memorable occasion with a religious or civil ceremony in the most symbolic churches, Synagogues or historic village hall courtyards. 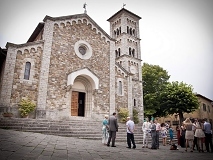 For legally binding civil ceremonies, you have an opportunity to choose from a wide list of medieval towers, stone churches or ancient chapels set amongst natural landscape of vineyards and olive groves of a hilltown such as Castellina Chianti, Certaldo and Greve in Chianti. Religious wedding ceremonies will have you choose amongst churches of high artistic and historical importance in cities such as Florence, Siena, and San Gimignano. (note: religious weddings require 4-5 months for planning and organizing). We provide you with all of the necessary information and assistance for proper procedures and legal documentation that coincides with the Italian government. We will help you organize and retrieve documents and translations so that the process is smooth and flawless. 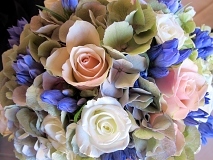 Tuscany In Wedding can arrange a personal meeting with local florists who will prepare tailor-made flower arrangements. You will be able to work exclusively with the florist to create the perfect bridal bouquet along with creating the ideal atmosphere with flower arrangements for your accommodation, ceremony, reception, and transportation. 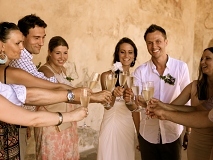 Tuscany IN Wedding can offer you a selection of the most ideal accommodations for you and your guests. Enjoy exclusive luxurious villas, romantic hotels, historical Renaissance castles, sophisticated estates as well as quaint and cozy Bed´n´Breakfasts housed on farmstead hills. Our expertise and experience will help you select amongst our many finely renovated and elegantly restored lodgings equipped with swimming pools and modern conveniences. We invite you to visit our site where you will discover a variety of charming and sophisticated accommodations in Tuscany suited for all sizes and budgets. Our diversified selection will provide you with affordable and convenient accommodations for you and your guests. Are you imagining a Tuscan ever-after as a small intimate gathering? Or, a grand lavish celebration? Our team of experts will help you design and unveil the most authentic and customized reception party that will set your wedding apart from all others. Imagine your cocktails and hor d´oeuvres set in a rustic wine cellar, dinner in a Renaissance castle, and dessert amongst an endless sea of vineyards. Tuscany IN Wedding will help you choose the right venue that best suits your imagination, whether it be a large estate, a villa, historical hall or garden with a postcard perfect backdrop. 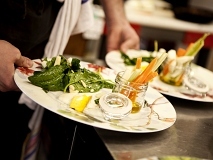 The cuisine selecting is an extremely important part of the wedding. We will work together to organize the perfect menu that will have you and your guests indulging in some of Italy´s finest delicacies. From homemade pasta to local specialties such as bistecca fiorentina, olive oil, mushrooms, wide selection of cheeses, and cured meats. Italy is worldly known for its versified cuisine which can also include fish or vegetarian options at its best. Tuscany IN Wedding´s expertise in wine tastings will also help you chose the best selection of wines that will compliment your cuisine selection. A specialized personal chef or a team of professionals chefs is also available if and when necessary. Through our network of experts, we will offer you the best photographers who are well acquainted with the Tuscan land and light. Our professional photographers will capture your emotion seamlessly while integrating in the local environment and atmoshpere. A pre-wedding celebration party can be organized on the terrace of a Tuscan villa, in a garden or wine estates where it is possible to organize private events. You and your guests will be able to dine in an unforgettable atmosphere with renowned Tuscan cuisine accompanied by world-famous Chianti wines, Brunello di Montalcino and Nobile. Make your wedding celebration a vacation as you and your guests enjoy a variety of activities in the rural Tuscan hills or the nearby cities for the duration of your stay. Tuscany In Wedding can help organize wine tastings in nearby estates, bike riding and hiking through the hills, or guided tours of Renaissance Florence. We will also organize and provide transportation at your request. Italy provides a variety of romantic, adventurous, or artistic honeymoon destination. Tucany IN Wedding can help you organize and assis you in your honeymoon selection, in Tuscany or any other Italian region.